Responsive neurostimulation is a new approach for treating medically uncontrolled partial onset seizures. The NeuroPace RNS® System—the first device to automatically monitor brain signals and provide stimulation when it is needed— is approved by the U.S. Food and Drug Administration as an adjunctive treatment for adults (18 years or older) with partial onset epilepsy whose frequent, disabling seizures have not been controlled by at least two different medications and have one or two seizure onset zones. The surgeon places the NeuroPace RNS® System Neurostimulator under the scalp and within the skull and places one or two leads at the seizure target. 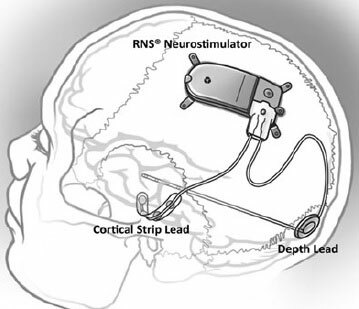 The leads are connected to the neurostimulator, which should not be noticeable to others after the scalp heals. The neurostimulator continuously monitors the brain’s activity and is programmed by the epilepsy doctor to detect and record specific patterns that could lead to a seizure. When these patterns are detected, the neurostimulator responds with brief pulses of stimulation intended to disrupt the abnormal brain activity before a seizure occurs. Detection and stimulation settings are individualized for each patient’s patterns and so that stimulation is not felt. In addition, each patient gets a take-home monitor so that brain activity data can be sent to the epilepsy doctor between office visits. Although not a cure for epilepsy treatment, the NeuroPace RNS® System reduces seizures in most patients. Prospective clinical trials have demonstrated median seizure frequency reductions of 44% at one year, 53% at two years and seizure reductions ranging from 60 to 66% three to six years post-implant. “The NeuroPace RNS® System represents a quantum technological leap over previous devices and we are pleased to bring this innovative technology to our patients with intractable partial seizures who may not be amenable to resection for seizure control,” Dr. Lasala explains. Watch an animated explanation of how the NeuroPace RNS® System works.